3 Bedrooms 2.5 Baths. Beds for 6. Sleeps 9. Fully furnished. Just bring clothes! SPECIAL LONG-TERM RATES FOR 1-2 OCCUPANTS. Enjoy the comforts of home in a safe, quiet, luxury resort! Perfect for professionals on temporary duty. Just 20 miles west of Honolulu International Airport, easy exit off main road. Near Kapolei & Ewa. More convenient than Waikiki or the airport to West & Central Oahu including the N Shore, Makaha, Waianae, Mililani, Waikele, Kunia, & Waipio. Kalaeloa airport is 1 exit away. Quick 1-mile drive on private roads to 5 beautiful, clean, uncrowded, & calm beach lagoons. Swim, snorkel, sun, picnic or nap under a tree. A 1.5 mile jogging path connects the 4 main lagoons. Play 18-holes @ the Ted Robinson-designed golf course. Stroll or drive the electric golf cart down tree-lined streets to explore the resort beaches, hotels, tennis courts, gym, shops and restaurants. From the world-class marina, you can take a swim-with-the-dolphins or whale-watching tour or charter a boat for blue-water fishing. Central air conditioning, cable TV, & ceiling fans in all bedrooms & living room. Free high-speed Internet with WIFI, free long distance to US, Canada & US territories. Portable stereo AM/FM radio-CD player with iPod dock. Inkjet printer/fax/scanner/copier available. Free parking for 1 car on the driveway. Fully-furnished 3 bedrooms and kitchen with towels, linens, dishes, utensils, glassware, cookware, major appliances provides you with everything to make you feel at home. Spacious master bedroom has extra-firm Beautyrest queen mattress for support with a body-molding Novafoam topper, 12 ft-long mirrored closet, ensuite bathroom with glassed-in shower, stocked linen closet, & 32' LCD TV with cable and blue ray DVD player. The other two bedrooms each have 2 twins that can be converted to a king, & LCD TVs with Blue Ray DVD/CD players. Hall bathroom is a full bathroom with a tub and height-adjustable shower head. High quality and attractive linens on all beds. Comfortable washable pillows made of memory foam pieces that mold to each person (same construction as the pricey "MyPillow" sold on TV.) 100% cotton towels and bed linens. Owner and relatives use this resort home, so it is not spartanly furnished like a hotel, but stocked with lots of little extras that guests are welcome to use. Wii and Wii Fit for the living room TV. Super bargain for groups! Beds for 6. Microfiber sofa has 2 recliners that open nearly flat for extra overnight guests. Rattan sofa is firm as a bed and long enough for 6-footers. Full & queen inflatable mattresses, full-size folding futon mattress also available on request. Whirlpool stainless appliances including full-size refrigerator-freezer with in-door water & ice dispenser, glass-top range and self-cleaning oven, built-in microwave, & dishwasher. Attractive & easy-to-clean Corian countertops. Vitamix blender, 6 qt electric pressure cooker (like "Instapot"), 10-cup rice cooker, 12-cup coffee maker, coffee grinder, 4-slice toaster-oven, cookware, bakeware, utensils, glassware, plastic storage containers, picnic supplies. Half-bathroom and laundry downstairs near entry-way. Full-sized stacked LG/Kenmore front-loading washer & steam dryer. HE detergent, Oxyclean (safer than bleach! ), & dryer sheets provided. Community BBQ area just around the corner with a tiled non-chlorinated non-diving pool (3.5 ft depth makes for warmer sun-warmed water) and in-ground hot tub. Outdoor shower, men's and women's bathrooms, 3 large BBQ grills, and ample tables, chairs, and loungers make it a great place for the family cookout. Eat out or eat in? On-sight options include the acclaimed Roy's Restaurant overlooking the 18th hole. At Ko Olina Station are Country Market with deli (check out their sandwiches, soups, & salads and extensive wine selection), Just Tacos Mexican restaurant & bar, Hawaiian BBQ, Monkeypods (a Peter Merriman restaurant and bar with live Hawaiian music), and Two Scoops, a frozen Yogurt shop. Sushi Yuzu offers a modern take on Japanese favorites. There's also Chuck's Steak House at the Marriott Beach Club, the nightly Paradise Cove Luau, & several restaurants @ Disney's Aulani Resort including a nightly buffet that may be the best buffet on the island . Four Seasons Hotel and Spa has several highly acclaimed restaurants, including Mina's Fish House. Outside the resort, drive 6-8 minutes east to Kapolei where you can choose from over 200 eateries. At the first exit is Kapolei Commons with Down to Earth, an organic health food grocery & deli, Genki Sushi, Ramen-ya, Dennys, delicious burgers and sandwiches @ Kua Aina & Subways, Aloha Salads, & Menchies Frozen Yogurt. At the 2nd or 3 exit, the newest enclosed mall, Ka Makana Alii has shopping, restaurants, fitness center, and entertainment. Stock up on staples at Costco, Target, Foodland (a local grocery chain with the best poke! ), Safeway, Longs, KMart, Walmart, all within a couple of miles of each other within Kapolei. 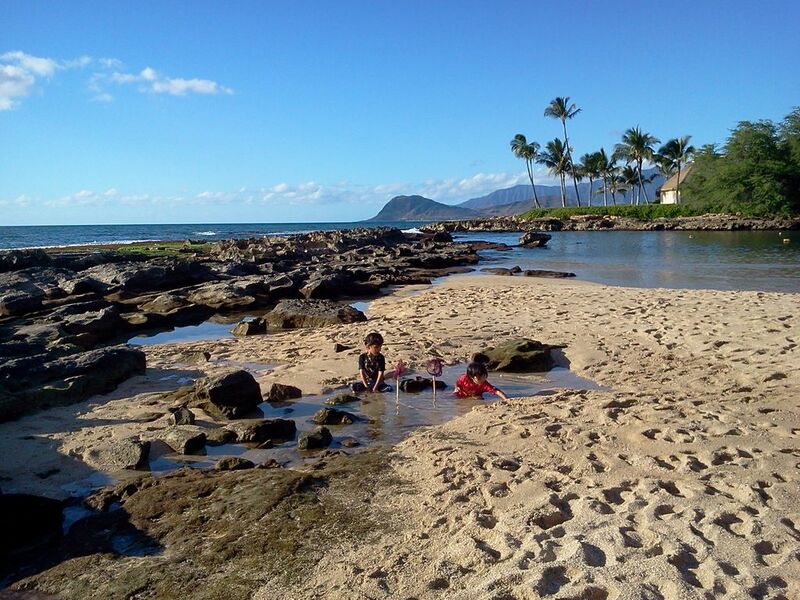 Ko Olina is a great place to explore Oahu. West of Ko Olina, see the surfing at famous Makaha Beach, hike to undeveloped Kaena Point, a bird refuge for endangered native Hawaiian birds. Head to the famous surfing beaches along the North Shore, see endangered sea turtles & monk seals. Book a glider ride or parachute jump at Dillingham Field in Mokuleia, then watch the colorful kite and windsurfers offshore. Shop and dine in Haleiwa for shave ice, clothes, local crafts, lunch truck specialties, or play golf @ Turtle Bay Resort, then pick up live shrimp from the aquaculture ponds or eat a plate of fresh shrimp at a lunch wagon. Don't miss the Polynesian Cultural Center in Laie - you could spend a whole day here! Continue driving the 2-lane country road to the beautiful Byodo-In Temple at the back of the Valley of the Temples in Kahaluu. Charming Kailua town & neighboring Lanikai is known for its world class kiteboarding, windsurfing, and kayaking on turquoise waters. Take scenic H3, Likelike, or Pali Hwys back to Honolulu or follow Kalanianaole Hwy along the NE coast to Sea Life Park and Makapuu Pt. Hike to the lighthouse - bring water and an umbrella to shade you on the hot walk! Waikiki has a unique aquarium, & famous but crowded beach. Ala Moana Shopping Center is 4 stories tall & two full city blocks long, the largest open air mall in the US. Visit Iolani Palace, the only royal palace in the U.S. just across from the statue of King Kamehameha, and historic Kawaiahao Church. If history and WWII is of interest to you, visit the Arizona Memorial and Museum, and take the time to visit the USS Bowfin & USS Missouri. The outstanding Pacific Aviation Museum on Ford Island in Pearl Harbor is a must see for WWII and aviation buffs! In Waikiki, next to the Hale Koa Hotel, is the Army Museum. For Polynesian culture and artifacts, the Bernice Pauahi Bishop Museum is a must. For inexpensive souvenirs and omiyage (gifts to bring home for friends & family), stop at the Aloha Stadium Flea Market open on Wednesdays, Saturdays, and Sundays. A small admission fee per car allows you to shop for clothing, food, souvenirs, jewelry, at a fraction of the retail price! I grew up on this island, but rarely ventured west of the Aloha Stadium near Pearl Harbor. My husband came to the island in the 70's from the cold Midwest and didn't want to ever leave. This is our second home away from home. Ko Olina reminded me of how West Maui was when Kaanapali and Kapalua were just starting up as an upscale destination. I had no idea this beautiful oasis was on the same island as our bustling capital of Honolulu. I love the huge shade trees, the best marina in the state, gorgeous natural and man-made lagoons with clean, calm waters, tennis courts, and an 18-hole professional tournament-quality golf course. It has everything we need for an ideal retirement! Upscale resort with a neighbor-island feel, yet big-city benefits of Honolulu and Oahu Island within easy driving distances. Endangered and rare Hawaiian monk seals, turtles, dolphins, and whales frequent the area. Water features at the top-rated Ko Olina Golf Course attracts native birds. Beautiful tree-lined streets are pedestrian and bike-friendly, and you never tire of the views from the 1.5 mile shoreline walking path. Disney had good reason to pick this area to build their hotel and timeshare. The Wet-N-Wild waterpark is just one freeway exit away, as are Costco, Home Depot, Safeway, Ross, Target, TJ Maxx, Kapolei Shopping Center, Foodland, Kapolei Commons, Kapolei Public Library, Walmart, hundreds of restaurants including local 24/7 favorite, Zippy's! Best place to safely walk, ride a bike, cruise along in our 4-passenger electric golf cart, and swim in clean, calm ocean lagoons. Friendly community pool, spa, and BBQ area to meet the neighbors. Lagoons are uncrowded due to limited free public parking, about 20 stalls each at Lagoons 1-3, and 100 stalls at Lagoon 4 (Ulua). Pay parking is available at the marina for approximately $10-12/day or$4/hr. Long-term residents enjoy discounts at shops and restaurants, plus use of the tennis and workout facility. toilet, combination tub/shower, Storage in vanity and mirrored medicine cabinet. Quality cotton towels provided. Two linen closets upstairs hold towels for indoor use only. (Separate cotton towels for the beach and pool are kept downstairs in the garage. If you need to dye your hair or need a cotton rag, cut up one of the stained or ragged towels in the garage.) Soaps, shampoos, conditioners, lotions provided. Master bathroom has glassed-in shower stall with bench seat. Hall bathroom has combination tub and shower with shower curtain and liner. Half-bath is downstairs, with toilet and washbasin. Owner's supplies on hand include Q-tips, alcohol, peroxide, sunscreen, toilet paper, hand-held bidets, bandages, vinegar, disinfectant, hair gel, air freshener, & shaving cream, which renters are welcome to use. Man-made and natural lagoons attract endangered turtles, monk seals to share the beaches & waters with visitors. Clean, safe, & calm waters without the crowds of other beaches. Gorgeous sunsets! Waianae Mountains are the backdrop for Ko Olina. Lighted 4-speed ceiling fans in living area and all 3 bedrooms provide for natural cooling to supplement or replace the central air conditioning. Digital thermostat near the base of the stairs. Quality cotton linens for all beds. Some microfiber and poly-cotton sets available on request. Full-size front-loading high-efficiency (He) LG washer with He liquid detergents, Oxyclean, and spot treatments provided. Instruction manuals provided or ask owner if not familiar with newer washers! Free parking for 1 car. Garage used for golf cart, beach and pool towels and toys, owner's supplies. One vehicle can park in driveway outside. Large groups should rent a full-size van or minivan. 1 car garage with remote provided. Room for 1 car or minivan in driveway. Electric golf cart (4-seater) kept in garage. Free high-speed broadband wireless, plus a WIFI enabled ink-jet printer. Two large plastic bins in the garage have 2 dozen+ towels for beach, pool, or rag use. Towels in the 2 linen closets upstairs are for indoor use only. These may NOT be removed nor used to dye hair. Beach and Sports club membership with tennis court access, fitness room, available for renters staying at least 30 days. Renter pays small fee for each photo ID. Living-dining room has dining table, two sofas, 6 dining chairs, 4 folding stools, CD/AM/FM player, side table, ottoman, 46' HDTV with blue-ray DVD player, dgtl cable service with 200+ TV & radio. Stainless Whirlpool model with multiple wash cycles. Liquid, tablet soaps, + Rinse provided. Stainless Whirlpool side-by-side model with in-the-door filtered water, ice, crushed ice dispenser. Ice-maker and storage bin will make enough ice to fill the rolling cooler! Electric glass-top stove with 4 burners. Large self-cleaning electric oven with broiler pan, cookie sheets, pizza pan, muffin tin, loaf pan, 2 8x8 brownie pans. Large enough for a big Thanksgiving turkey! Powerful built-in over-the-range microwave with turntable and auto sensor functions. Large carafe style coffee maker with timer and auto shut-off. Purchased Dec 2019. Owner has coffee, tea, spices, oils, sugar, soy sauce, vinegar, olive oil, canned goods, garbage bags, plastic wrap, waxed paper, aluminum foil, plastic bags & more. Please replace what you use up. Dishes, glassware, microwave-safe plates and bowls, 18-8 Stainless utensils for 12 people. Dansk china for 8. Disposable chopsticks, paper plates & cups, plastic utensils for picnics! Fully-equipped kitchen w/ stainless appliances, double-sink w/ retractable hose. Stocked with more than the basics. Vitamix, 10c. rice cooker, 6-qt pressure cooker, spices, condiments, oils & vinegar. Living-dining area has table for 6, expands to seat 8-10. Four folding stools serve double duty as TV tables for plates or drinks, or extra seating. HD TVs in Living Room and all 3 bedrooms. DVD players for each TV! Digital cable with over 200 TV and radio channels. Stereo Radio/CD player with iPod/MP3 player docking station. Four DVD players, one for each TV. Blue-Ray DVD in living room and one bedroom. Living room shelf has over 80 DVDs. Limited music library. Blues, Jazz, Hawaiian. Large assortment of beach toys for building sand castles and flotation toys for the ocean. Over 80 DVDs, all genres. Patio has glass-top table with 9-ft diameter tilting umbrella, 4 padded chairs. Resin-wicker loveseat, armchair, glass-top coffee table, Large 4-burner gas grill. Burn residue & clean after ea. use. Boogie boards for all ages, snorkeling gear, flotation rings, rafts, noodles, beach balls, sand toys, air mattresses, inflators. 2 tennis courts available with sports club membership (for renters staying at least 1 month). At least 2 tennis rackets available, possibly 4. Electric 4-seater golf cart ( EZGo or Yamaha Club Car) available for licensed drivers 18+ yrs. Cruise over to the store, fitness center, tennis court, beach or golf course. Tiled pool (see photos!) is warm and inviting. Shallow depth (3.5 feet) is just right for water-jogging or leisurely swimming. One-minute walk, across the street & around the building! Salt used! Ko Olina luxury resort offers access to world class amenities: championship 18-hole golf course, beach lagoons, private marina, restaurants, & spa. Private lanai has 4-burner gas grill. Community in-ground pool, jacuzzi & gas grills. Walking paths throughout the resort. Full kitchen w/ maple cabinets & stainless Whirlpool appliances. Refrigerator-freezer w/ filtered water & ice dispensers, dishwasher, glass-top electric range & oven, built-in microwave oven, toaster, Vitamix blender, 12-c. coffee maker, large rice cooker, slow cooker, stainless & non-stick pots & pans, bakeware, utensils, stainless cutlery, Dansk china, glassware, kid-safe plastic plates, dishes, & cups. Full-size digital front-loading HE washer & steam dryer. Living rm has rattan sofa + 3-seater sofa with 2 recliners. Sony stereo with iPod dock. Boogie boards, snorkeling gear, cooler, beach chairs & mats, floats, buckets and shovels for kids, electric golf cart for 4, 1 parking. Really nice peaceful place we felt safe with kids and great to go for walks in morning for coffee or in evening by the ocean also great place to watch sunsets. Great and fantastic! Thank you for comfortable stay! Nice and friendly owner! Thanks to no dirty shose policy, floors are so clean. Bedroom is also really clean and comfortable. Air coditionig is excellnt to adjust to our comfort. Bathroom and shower room are also clean and easy to use. Body boards and shnorkeling kits are available. In addition, golf carts are available. The location is calm and close to beach and shopping centers. This is difinitely recommended property especially for long stay. Jacqueline was really aloha and will call us several time to see if we need anything. I will be sending my friends to this place. Love it. GREAT PLACE AND A FUN AREA TO BE AT!!! The house was perfect for our stay. We had 4 adults and 3 kids and it was the perfect fit. With shops and restaurants with driving distance and the great time we had at the Aulani Resort, there is nothing not worth staying here for. Jackie was a great hostess meeting all our expectations and then some. We will definitely recommend this to any one looking for a place to stay while visiting the islands!! The place was exactly as mentioned. The rooms were spacious and the place was very well stocked. Our stay was relaxing and just the break we needed from the midwest winters. Jackie (owner) greeted us upon arrival and also came back the next day with goodies for us. She was very thorough in explaining things about the house and places around Hawaii. We would definitely consider staying at this property again in the future. We came in to town for a wedding which was at the Ko Olina resort. We had 3 adult couples and we all found this townhome was perfect for our needs. Jackie is a wonderful person to work with and she keeps this home in top shape. We found that the house had everything we needed including a computer with printer and Internet/WiFi (handy for printing directions and return flight boarding passes). The location is close to the beach and Ko Olina resorts ( short drive or long walk) We didn't use the pool but it looked as it does in the pictures. The beds were comfortable and the rest of the amenities provided us all we needed for our stay. There is a well stocked market and restaurants on the resort property or Kapole is a short 5min drive for shopping, dining and Costco. Not a big deal for us but worth mentioning, parking is limited (we had a car which we parked in the garage plus an SUV parked in the driveway. Any additional vehicles would need to use the visitor parking which is steps from the townhouse. Mahalo Jackie! If deep-sea fishing is on your list of things to do, the best place to go is the Ko Olina Marina to charter a fishing boat for the day. It's way more convenient than the boats at Keehi Lagoon in town, plus you'll be dropping your fishing lines within 10 minutes of leaving the docks compared to 1.5 hours from Keehi Lagoon. Swim and snorkel with dolphins or take a sunset cruise up the Waianae coast. Call for quote - 30 day min lease required (limit of one renter per 30 days) call eight-o-eight three 87 five 7 three 7. Special rates for 1-2 people occupying a single room, or Military/Gov't employee/retirees with no more than 1 vehicle. Refundable security deposit $1000 w/ damage insurance. No insurance = security deposit of up to 1 month's rent Payment by echeck, credit or debit card. For non-family rental, no more than 5 unrelated people per residence. For families >6, additional family members may be accommodated for $35/night/per person plus taxes. Renters are expected to clean up after themselves while staying in the townhouse (picking up dropped items, cleaning up spills immediately as you would /should at home!). Cleaning cost depends on how long it takes to restore unit to ready-to-rent condition @ $50/hr per cleaner and does not include carpet shampooing. Cleaning fee may be partially refunded or increased based on actual cleaning costs. Optional weekly cleaning charges may be waived or refunded based on mutual agreement by owner and renter. Homeaway charges a booking fee, up to $499. Long-term rentals of 6+ months will be heavily discounted + lower tax rate used. Month or longer leases may be done outside homeaway with 1 month security deposit and each month's rent due NLT at the end of the previous month.